NOTE: We are not handling the money transfer/transaction for your company we just do the tracking. This means we are not transfering money from your Stripe account to your affiliates' bank or from your Paypal account to affiliates' Paypal account. However we offer alternatives that are both cheap and fast. FirstPromoter allows you to pay through any payment provider you want, including bank, cash, etc as long you mark the payouts as completed, but we recommend using Paypal Mass Payments to pay multiple affiliates at once (it takes 5 minutes/month to pay hundreds of affiliates). Generating the payouts. Done automatically according to the payout terms set on the campaign. More details. Paying and marking the payouts as completed(presented below). b) A TXT file with amounts to pay for each affiliates which is generated by FirstPromoter. 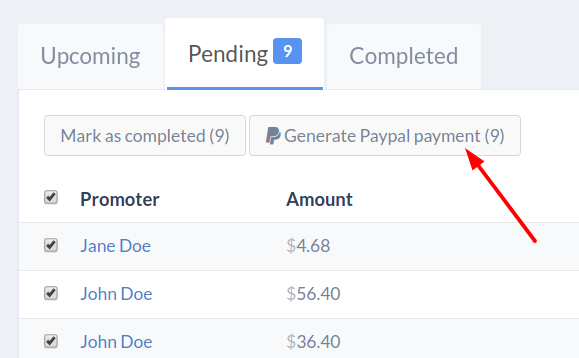 select the pending payouts you want to pay. You can use the Date Filter to filter by Due date if you have multiple campaigns with different payout terms. 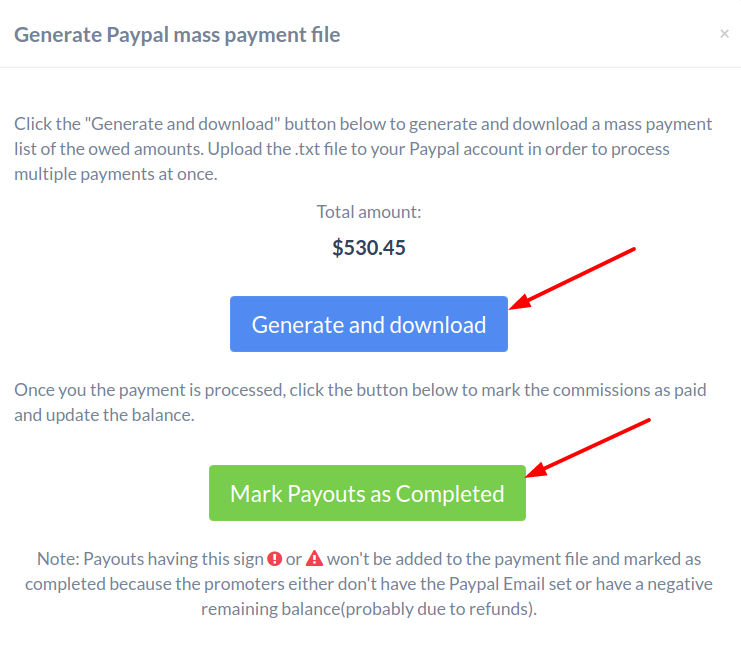 Upload the downloaded file to Paypal (login to Paypal and go to Tools > Mass Payments). to pay the entire balance let the amount field blank. For a partial payout, enter the amount - make sure the amount is not higher than the one you see on Payouts > Upcoming, Remaining balance column. check the payout item and click "Mark as completed"